Sinclair A Mackenzie died at Hillton Latheron 17th February 1941 aged 71. 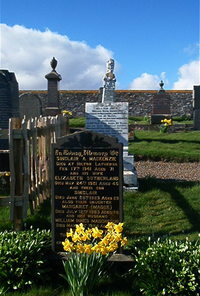 Wife Elisabeth Sutherland died 24th May 1921 aged 45. Son Sinclair s died 28th June 1929 aged 29. Daughter Margaret Sutherland (Madge) died 12th July 1983 aged 78. Husband William Innes Macgreggor died 31st May 1984 aged 78. Both interred in Tomnahurich Inverness. Erected by their daughter Margaret.